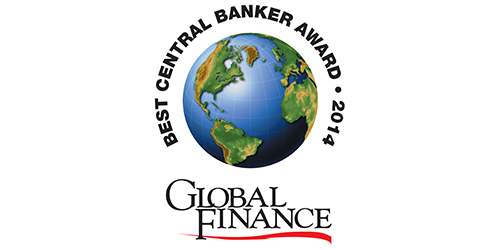 NEW YORK, September 5, 2014 — Global Finance magazine has named the heads of the central banks of India, Israel, Malaysia, the Philippines, Saudi Arabia, Switzerland and Taiwan as the World’s Best Central Bankers over the past year, in recognition of their achievement of an “A” grade on Global Finance’s Central Banker Report Cards. In addition, the central bankers of Chile, Colombia and the European Union earned “A-” grades. The Central Banker Report Cards, published annually by Global Finance since 1994, grades central bank governors of nearly 70 key countries (and the European Union) on an “A” to “F” scale for success in areas such as inflation control, economic growth goals, currency stability and interest rate management. (“A” represents an excellent performance down through “F” for outright failure.) Subjective criteria also apply. This year, 17 central banks are being graded for the first time.